If a person always fears something every day and when he is not leading anywhere in life, his lifestyle shrinks or gets limited to the certain point of time where he starts feeling very uncomfortable and uneasy. Just having the strength to lead does not make you strong in any way, you will need the courage to face any kinds of problems in life. If you are fearless and nothing in this world can stop you from facing problems, then your life will automatically be expanded, as you are not being restricted to any criteria. If you fail once in life and you still fear that, there is no way that your life will expand. Your life will shrink drastically. When the strength is over and you have lost all your hopes, that is the time when you should take a proper decision, so that you lose all your fears and overcomes the failure in such a way that life automatically expands and opens new opportunities for you. It is not an easy task to lead in life but it is that you do not give up and build a strong courage that no one can break easily. When you look at small children, you will get a bright shine in their eyes which represents that they are totally fearless. They have no limit and dream beyond having the strength to lead. They do so because they do not care what people think of them or whether they will be rejected or not. All they have is eyes filled with big dreams. For them, failure is just a word, which they do not care about. They want to achieve it at any cost, no matter what the situation is with possible dreams and ambitions seem quiet endless journey. This need of courage is what we adults must learn from children. However, as children start to grow up when the strength is over, they start to face various challenges of life but it is where they come to know that it is not so easy to achieve anything. This makes certain limitations in their abilities or skill set as they are stressed out. It is not so easy for them to clear all obstacles and overcome failures in a fraction of time. It is the time when fear enters in their life making them think whether to do it or not. Therefore, fear always leads to shrinking of people’s dreams. There are some people who go against their fears and conquer their dreams with courage. All you need is having the strength to lead without any fears with great willpower so that you may crossover all the obstacles that may come your way when the strength is over. Never think about failure as it makes you weak from inside but it is what actually makes you stronger. Therefore, have confidence in your abilities and gather all the courage to achieve your goals no matter what comes in your way. 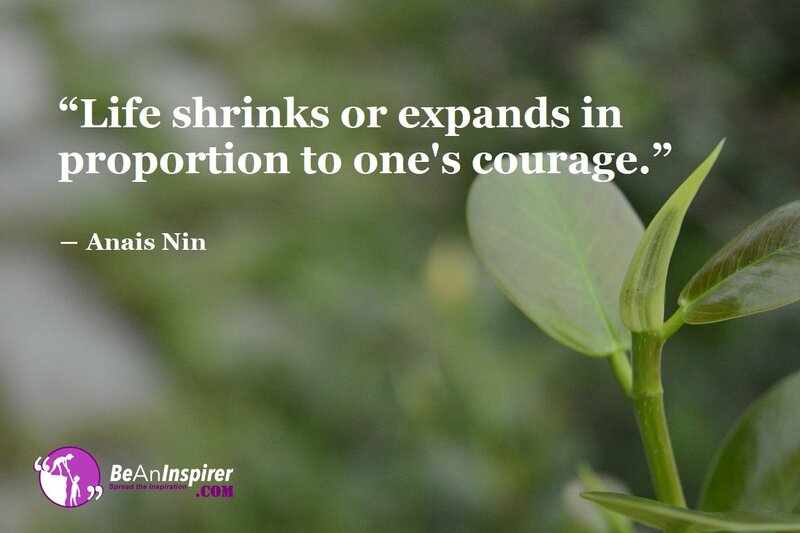 Do you feel Courage is what every person should have in every situation of life? Well Yes, how our life leads definitely depends on how we deal with it. We hope, we were able to imbibe some courage in you. Do let us know your views on the article by commenting below!